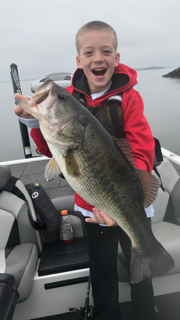 Tristan Richardson, 13, caught a 6 lb., 15 oz. bass using spinner bait on Houston County Lake recently. Courtesy Photo. 72F surface water temperature, water at normal level, stained in color. Good black bass to 6 lb 15 oz on spinner bait by Tristan. Other bass 5.8 lb and 6.0 lb at 6 PM Friday in 6-10 feet of water by Charlie Crame of Houston on Wacky worm black and blue flake. 9AM 6 each 2 to 2 ½ pounds each. Good crappie in one hour one person caught 16 fish average ¾ to 1 pound each on live minnows in 20-25 feet of water and 10 feet from the bottom. 7 pounds of bass per guy near the bank and 16 crappie in an hour before the cool front. Good catfish on jug lines and stink baits.